I used to think, being in this hobby for nearly 4 years, that using the correct solenoid fuses in your machines would solve a lot of issues with burned coils. You know how the story goes... a 20 year old driver transistor on the driver/CPU board in your game all of a sudden decides to short on, locking on a coil somewhere on the playfield. Common knowledge seems to think that if this happens, the coil will draw enough current during normal operation to blow a main solenoid fuse if it's energized long enough. It turns out, based on my experience, this is not the case. 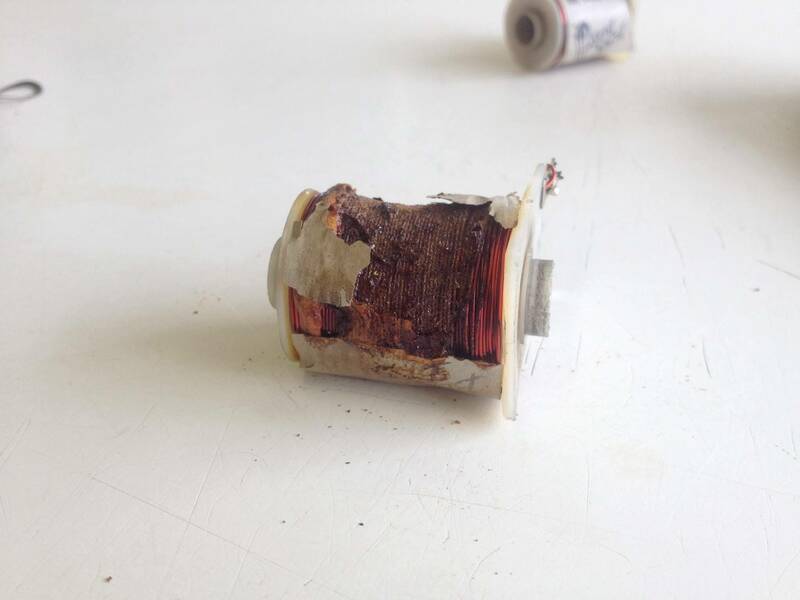 Even if you have all correct fuses in the machine if a coil locks on because of a bad driver transistor or a pinched harness wire, that coil WILL overheat and destroy itself. 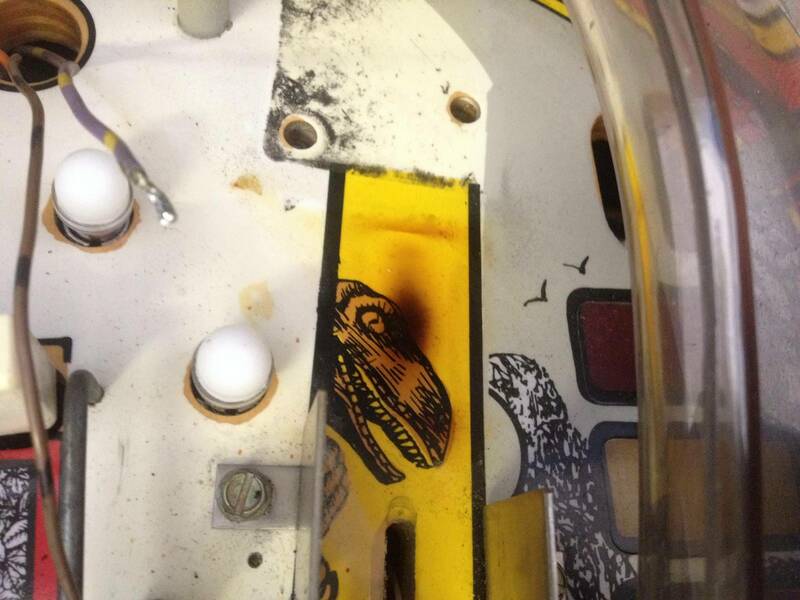 This happened on Jurassic Park and I had to disassemble quite a few things to replace the raptor kicker coil. Not only was this time consuming to repair, but it's also a serious fire hazard. 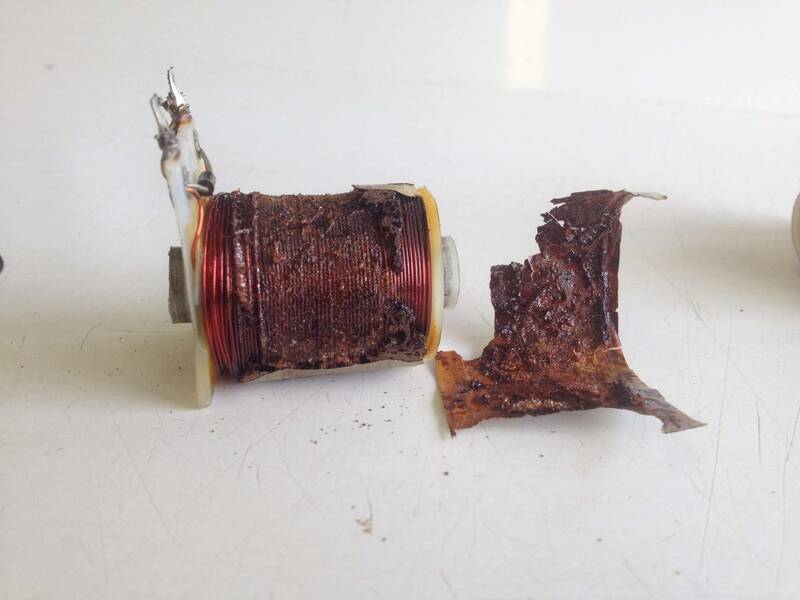 Just look at the damage this coil has done, not to mention everything that was destroyed due to a locked on coil in this Road Show! Then I had an idea. What if someone could sell a solenoid fuse board that protects every single coil in the game? 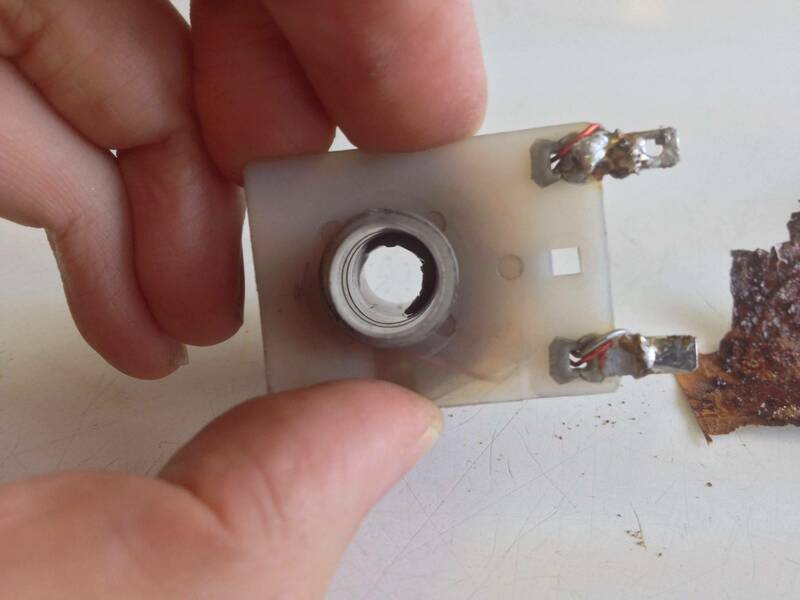 This will provide a much safer level of prevention for these types of scenarios in which a main 4A or 5A solenoid fuse, even which correctly rated for the application, will not fail until the damage has been done. I have thought about this before when everyone first started talking about the Addams Family power magnets. 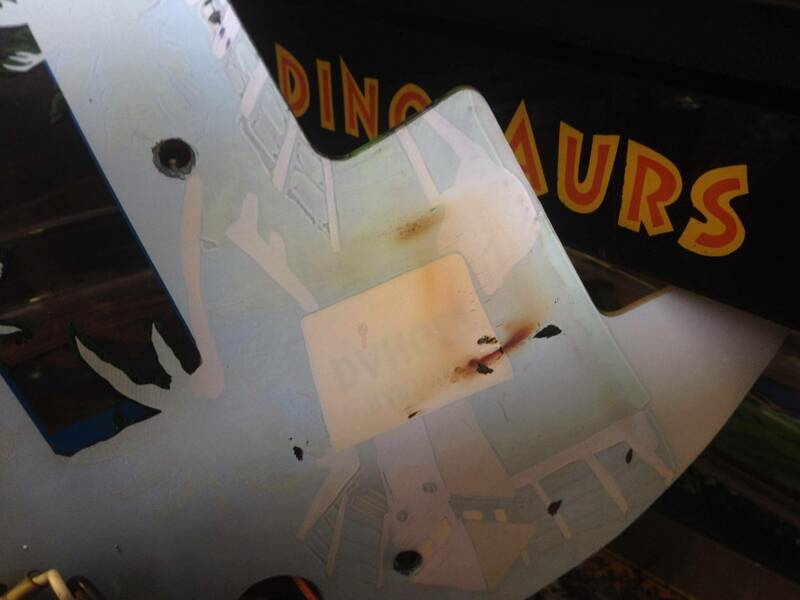 I have individually fused each magnet on both the games I maintain with 2A fuses to prevent permanent browning and general damage to the playfield. Why should other coils be any different? Sys3 has every coil protected by a single fuse under the pf and it does not prevent coils from burning like yours. Maybe a temp switch on every coil would do the trick. Thermistor in line with power wrapped to side of coil. 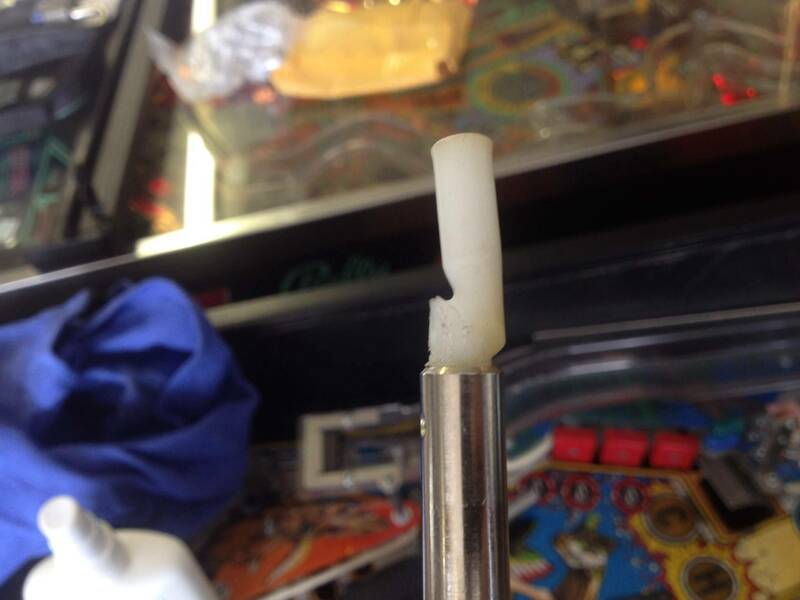 Adding a fuse to the knocker and chime coils is a good idea in a bally game. They are not protected like the PF ones. Yeah and what's the deal with knockers burning up all the time? When a knocker locks on, it isn't as obvious as a playfield coil because you can't see that its locked on. If you don't see it, and you can't hear it humming, chances are it will stay locked on until it burns. Has anyone actually tried installing thermistors? great idea Crash, individual fuses, thermistors (are like self resetting circuit breakers? ), or whatever is going to help prevent -fire damage!- like your pics show.. daayyyuummm! if a thermistor is like a heat sensitive self resetting circuit breaker well heck yeah, the right value in place would tell you a coil is having issues for it getting shut down too often and save boards etc. it might be some work pairing up different thermistor values (or whatever) to different coil values along with considerations for their location-duty-loading (when-where is "warm" "TOO warm"? ), or might be simply a threshold temp based on coil magnet wire insulation that can fail causing the heat. I'm sure not that knowledgeable but it makes total sense to me. could be as simple as taping it onto the top of the coil itself and wiring the power to pass through it on its way to the coil lug? if something like a pop bumper took "too many" hits in a short time period it could temporarily automatically be shut down to cool off and automatically re-activate itself too. things happen sometimes but if it were happening ridiculously frequently you might KNOW a coil needs a replacement, without risking driver transistors etc. brilliant idea if it'll work! We use thermal cutoff (TCO) switches inside our rechargeable battery packs (TCO's made by panasonic). Flat surfaced - seems it wold fit right onto the outside of a solenoid. When high temp threshold is exceeded - switch opens, stays open until temp drops below a low temp threshold. Can't remember part numbers off hand but it seems these would work quite well in this situation. Crash, your initial thinking could generate some profits and save many a lot of headaches. Thermistors are used in copy machine fusers. They open up if the fuser (what melts the toner) gets too hot. Only problem is they cost more than the a solenoid coil it would protect does. Only problem is they cost more than the a solenoid coil it would protect does. I suspect protecting the rest of the game (and perhaps the house) are worth it. I thought a thermistor just permanently opened up, didn't know it would reset. I imagine turning a locked coil on and off potentially hundreds of times on location until the issue is discovered wouldn't be very useful. If an actual fuse blew as a result of the coil drawing an excess current for too long, that would seem to be an ideal solution. Just stick in a slo-blo fuse that is slightly underrated for the coil's draw. Normal operation may warm the fuse, but a prolonged application of power (say 5 to 10 seconds) would blow the fuse and save the coil (and possibly the game should a fire otherwise occur). Canon copier equipment i have worked on calls them thermistors. They pop an error code on the copier that has to be cleared and it will work again once cooled. Since they cost $100 each for a fuser assembly thermistor, they may be more complex than a one shot device. 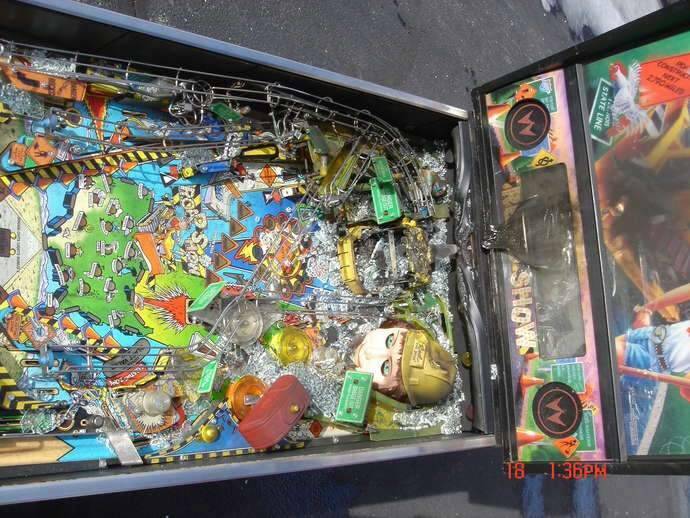 Thinking realistically this is just not going to be used in pinball. Great idea, just i dont see it making sense or catching on because of implementation. Putting a slow blow fuse on every solenoid coil is MUCH more realistic approach. With the right value protection should be fine. Just don't pull a bally and expect the solenoid knocker coil to blow a 4amp fuse until it goes super nova. Thermistors detect the temperature of the surface of the fuser roller and let the system board know when to turn the heat lamp on and off. I should have said "thermal fuse". They just pop open at a designated temp. I don't know if they are available in ranges applicable to pinball coils. I would think if a coil got hot enough to pop a thermal fuse the sleeve is a melted glob anyway, so it's done. Protecting the rest of the game from a locked on coil is along the same line as unplugging them during a storm. Thermistor is a temperature dependent resistor. Some are PTC (go up in resistance with heat) and some are NTC (go down in resistance with heat -- such as a Williams current inrush limiter). If they go open - then there is a design defect or they went wayyy over in temperature... they are not meant to go open completely. Going open and staying open sounds more like a thermal fuse or a fusible link. Or if reset from the front panel like the Canon - thermistor reached threshold and software shuts off power. Thermal cutoffs are often used in close proximity to things (rechargeable NiMH battery packs for us) and open/close depending on temp. We use Panasonic EYP2MP092AFT which cost us about a 50c apiece when bought by the case. Functions normally until it hits about 90C which is when it opens up and cuts off current. Stays open until temp gets back down to about 60C (drop of 30C in temp). Lots of hysteresis so wouldn't sit there opening and closing non-stop. Would have to scale up from this one, though as it is only rated at 32V, 2 amps. Seems some people are liking this idea. Has anyone with more time tried replacing their main solenoid fuse with a 1A fuse and grounding out its transistor for a few seconds to simulate a failure? How much current do most 25v coils pull normally? Pretty sure my black hole has almost every coil (pop and sling) on its own individual fuse.